Join the discussion on our forums! Come discuss Prince Taldaram over in our dedicated Prince Taldaram discussion topic. Three Princes stand before you. This one wants to copy others. This card is not as strong as one might think. It's a cheaper version of the Faceless Manipulator, but with the added price of forcing you to drop all other 3-cost cards in your deck. That's a fairly sizeable asterisk for the card to carry, as it kills the ability to build any Wild decks with it, and even if your deck fundamentally allows for the inclusion of the Prince without needing to cut other cards, the boon is questionable in value since by the time you can set up any large combo with it, the effect on the board-state it'll have might be negligible. Doubtfully, this is the card that will swing the game around in your favor. Even though it might do itself justice in the occasional Cubelock match, i do not see this card making it into any other deck. Turns out this guy got Voodoo-Dolled. Turns out this card is actually pretty good. got a slight nerf with the patches nerf, no longer gains charge while copying patches. Is this worth crafting for cube-lock? Looks like we've finally found a home for this guy in Cubelock. Well then you must have disenchanted him, because you can no longer open duplicates. Also you should have kept him, because he will likely fit into a good deck in a next expansion or two considering that blizzard designs Hearthstone expansions ahead of each other. Dude you are insane with the prediction for the next expansion. Carnivorous Cube has changed the meta and this card can copy the cube for insane value. 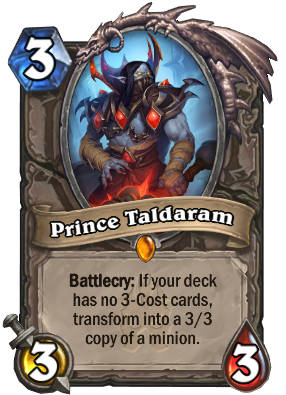 Prince Keleseth turned to be a rally good card and Prince Valanar bacame an OK card in Rogue and Warlock, hopefully this oprince will have it`s time to shine soon enough, and thus making the three princes worth having. Cubelock has made Taldaram good, but Fal’dorei Strider and Amethyst Spellstone have made Valanar bad. And Keleseth is still good. In the words of Meat Loaf, "don't be sad, 'cause two out of three ain't bad." Happened to me three times. Deinstalled. I've actually been having some success with Prince Taldaram in dragon priest where I only run one copy of shadow word death. Also I have been playing this really cool combo deck in druid where I use him to copy Malygos and do 22 damage with moonfire, but that combo is going to be a lot harder with the incoming innervate nerf. It can be hard to use, but this definitely isn't as bad as people think. It's funny to see everyone replying to this comment being salty, unknowingly having actually gotten a to-be tier one card. Hope you didn't DE it.